Litecoin investors have reacted with enthusiasm to the news that the Litecoin Foundation will held a summit in 2018. Everyone who has some Litecoin, whether it’s ten or a thousand, will come together to discuss the future of this cryptocurrency. What can we expect from the Litecoin 2018 Summit? The Litecoin Foundation hopes that a lot, business, merchants and other bodies that are involved in Litecoin will visit the summit. The event is going to be special, because it’s actually the first official gathering of the cryptocurrency. The main goal of the Litecoin summit is to have as much supporters of the cryptocurrency together as possible. The foundation is continuing it’s #PayWithLitecoin campaign, and the more support the better. Are you going to meet Charlie Lee? Litecoin will probably build up the hype before the summit will take place, it has done with other special announcements. Everyone is welcome at the summit, so do you. You have to fill in an application if you like to become an exhibitor at the event. Big chance that you will meet some inspiring Litecoin investors over there. Perhaps you even run into Litecoin creator Charlie Lee! 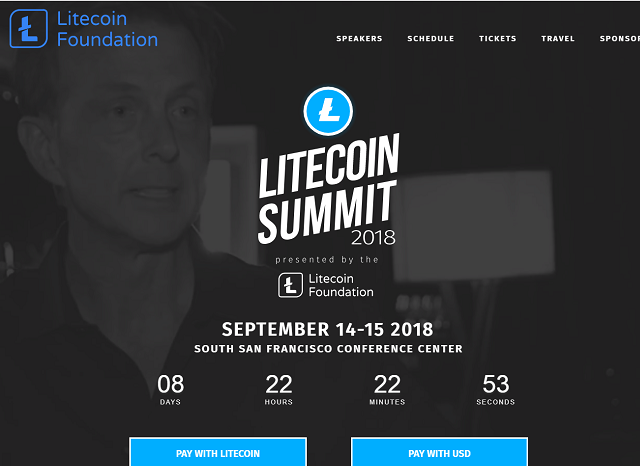 The Litecoin Foundation hasn’t shared a lot of details about the summit yet. More information is expected to be announced in the following months.